This article from the technical service team at Provimi Animal Nutrition India explains the symptoms of gout, its many different causes, and how producers can use management techniques to reduce its incidence. The modern day poultry bird has undergone several genetic modifications to upgrade its production efficiency in terms of better meat and egg production. The external environmental factors like nutrition, management and health of birds need to be optimum for the bird to express its genetic potential to the maximum extent possible. Buying birds of the highest genetic quality is not cost-effective unless that potential can be fully expressed. Due emphasis has not been placed on the health of most of the vital organs whilst selecting birds for egg and meat production parameters. This paves the way for greater incidence of metabolic disorders. Metabolic disorders arise as a result of improper metabolic processes within the birds’ body. The abnormal bio-chemical reactions can be due to improper functioning of the vital organs like the kidney, liver, heart and lung. The kidney is one of the vital organs that carries out diverse metabolic and excretory functions such as maintaining the chemical composition of body fluids, removal of metabolic waste and toxic products, regulation of blood pressure and blood volume and conservation of fluids and electrolytes. The function of kidneys is affected by a number of specific diseases and disorders. One of the important metabolic disorders associated with kidney damage in poultry is gout. Uric acid is the end product of purine and protein metabolism in poultry. Uric acid is formed in the liver and excreted by kidneys. Birds are uricotelic, lack the enzyme uricase and this along with the process of water conservation, allows them to excrete urine in the form of semi-solid uric acid in the faeces. Disruption in the metabolic process of excretion of uric acid leads to gout. So gout can arise either due to production of uric acid over the capacity of kidneys to excrete it, or due to compromised kidney function failing to excrete the produced uric acid. The latter is the more common reason for incidences of gout. Reduced excretion of uric acid leads to its accumulation in blood and body fluids. This subsequently favours its precipitation in various tissues. Growth depression and mortality can be due to high levels of uric acid in blood and/or due to uric acid deposit in tissues causing mechanical damage consequently affecting their function. Visceral gout – deposition of uric acid crystals in visceral organs like kidney, liver, heart and gut. It is the acute and more common form of gout reported in poultry. 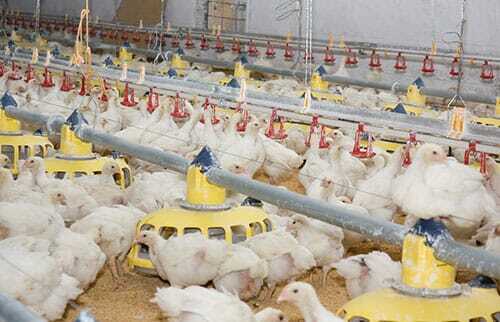 It causes huge mortality in poultry ranging from 15-35 per cent. It is observed in young poultry. Articular gout – deposition of uric acid crystals in joints, ligaments and tendon sheath. It is chronic form of gout and has some genetic predisposition. It is rarely seen in poultry. In both forms, deposits consist of white chalky needle shaped shiny crystals called 'tophi'. In gout, blood levels of uric acid can be as high as 44mg/100ml as compared to 5-7mg/100ml in a normal bird. General and non-specific symptoms like depression, reduced feed intake, ruffled feathers, emaciation, lameness, moist vent, enteritis etc. are observed, that are inconclusive of gout. Specific diagnosis is made on post-mortem, wherein lesions reveal urate deposition in various locations as mentioned earlier. There is irregular and excessive enlargement of kidney lobules. Calcium: Phosphorus ratio - Excess dietary calcium with low available phosphorus results in precipitation of calcium-sodium-urate crystals. Phosphorus acts as urine acidifier and low phosphorus aggravates the urate crystal formation. Sodium – Sodium intoxication puts extra stress on kidneys. Excessive use of sodium bicarbonate increases alkalinity of urine leading to kidney stone formation. Hard water with higher salt content is also a load on kidneys. Sulphates – Decreased calcium resorption causing excessive calcium secretion through urine favours gout. High levels of vitamin D3 increases calcium absorption from the gut which can favour further formation and deposition of urate crystals. Prolonged vitamin A deficiency causes sloughing of tubular epithelium and subsequent blockade resulting in accumulation of urates in the kidney. However, the incidence of gout due to vitamins is not all that likely under field conditions. Healthy kidneys are not affected by high dietary protein levels. Nevertheless, in case of pre-existing kidney damage, feed containing more than 30 per cent of crude protein can be dangerous. This leads to excessive uric acid production which further worsens the kidney function. Adulteration of protein supplements with urea increases the nitrogenous component, further enhancing the uric acid production. This coupled with kidney damage can lead to gout. Infectious bronchitis virus (IBV) - Nephropathogenic strains of IBV affects the kidneys leading to nephritis and high mortality. The disease, when vertically transmitted, affects the kidney of progeny leading to gout in young chickens. Avian Astrovirus – There are two species of this virus, avian nephritis (ANV) and chicken astrovirus (CAstV). Both the species damage the kidney affecting its function, thereby leading to uric acid deposits in various locations of body. Acute nephritis and damaged kidney lesions were observed in SPF chicks infected with ANV. Similarly, experimental infection of specific pathogen free (SPF) chicks with CAstV has led to gout symptoms. Additionally CAstV has been isolated from gout affected commercial chicks in India. The avian astrovirus group, like IBV, is vertically transmitted. Infectious bursal disease (IBD) – Though not to a large extent, this disease has nevertheless has been one of the predisposing factors for gout. Ascites – Hypoxic conditions increases the production of uric acid. Ascites in initial stages can lead to symptoms of gout. Ochratoxin, citrinin and many of the pesticide/insecticide residues have ill-effects on kidney tissue, causing inflammation of kidney tubules and ureters. Other management issues to consider include providing effective ventilation to maintain correct temperature, humidity and air flow, starvation for long periods due to lack of access to food, and high diurnal variation. Antibiotics that are excreted through kidney put extra load on kidneys when they are included in doses exceeding their recommendations. Phenol and cresol derivatives, when erroneously used, have residual toxic effects on kidneys. High doses of copper sulphate in water can lead to gout subsequent to reduced water intake by birds. An obstruction in the ureter of the bird is an additional cause. The preventive measures should comprise of an holistic approach towards gout management. It should start right from breeder level up to the commercial farm. The following measures need to be practised. Review the infectious bronchitis (IB) vaccination program in breeders and commercial flocks. In areas where IB is endemic, vaccine spray at hatchery level can be effective. Vaccination with a nephrotropic strain at day 4 or day one beak dip vaccination has also proven to be beneficial in commercials. Vaccination for avian astrovirus, inclusive of ANV and CAstV, needs to be a mandatory part of breeder vaccine schedule, to prevent the transmission of virus to progeny. Mycotoxin management is a must for preventing gout. Proper screening of raw materials for mycotoxins, and judicious selection and inclusion of these raw materials based on their mycotoxin levels is required. Feed need to be supplemented with good quality toxin binders and acidifiers to take care of mycotoxin and microbial (bacterial and fungal) load respectively. Judicious use of antibiotics, disinfectants, chemicals, anticoccidial etc. to reduce load on kidneys. Optimal incubation conditions – correct temperature and humidity need to be provided. Optimal egg storage and handling conditions. Once hatch is pulled off, chicks should not be held for long without water. Likewise, it should be ensured that chicks are not deprived of water for long, wherein long distance transportation is involved. Optimal brooding temperature needs to be maintained. Adequate ventilation should be ensured in the farm. Balanced feed with respect to optimal calcium: phosphorus ratio need to be provided. Ideal electrolyte balance should be adopted. The sodium content in feed should be given due care, making sure that they do not exceed more than 0.5 per cent. The sodium from water sources also needs to be accounted for here. The sodium coming from sodium bicarbonate source needs to be reduced in the case of incidences of gout. In cases of gout, provision of additional electrolytes through water, aids in flushing out uric acid crystals, thereby controlling mortality to certain extent. Use of jaggery (concentrated sugar) also seems to be beneficial. In areas with a history of gout, feed protein should not exceed the standard breed requirements. The raw materials should be carefully monitored for adulteration with urea, which might be one of the reasons for increased uric acid production. Feed dilution should be practiced when gout is observed. This can be carried out either by partial dilution of feed with grain source or by entire replacement of feed with pure grain sources (ground maize) for three to five days to reduce the exertion of kidneys to expel uric acid. Ample numbers of waterers should be provided to encourage ad libitum water intake. Similarly, the waterer height needs to be adequate according to the size of birds. Provision of urine acidifiers like vinegar, potassium chloride, ammonium chloride and ammonium sulphate through water/feed seem to be fruitful to reduce the incidence of gout. Kidney revitalisers play a vital role in boosting up the kidney function, thereby facilitating the flushing of accumulated urates, and need to be used in water. This can be used as a preventive measure in flocks with a previous history of gout in the initial week of chick’s life. It can also be used as a prophylactic in water for 4-5 days continuously, for effectively controlling the gout mortality. Provision of methionine hydroxyl analogue, diuretics, coconut water and so on, has also been found be beneficial in controlling gout. Gout in India is still one of the major causes for huge mortality and morbidity in poultry, causing great monetary losses to the producers. Breeder management along with adequate farm and hatchery management are crucial in preventing incidences of gout. Gout due to water deprivation, particularly in the winter season in India's northern states, should be taken care of by providing optimal brooding temperatures. The producer should be proactive enough to include optimal additives/supplements in water that would aid in cutting down the usual mortality pattern. Any practice that encourages flushing out uric acid crystals should be adopted, the easiest and vital being boosting up water intake, or else the whole effort of providing medications through water can be futile. Authors: Dr Nalbalwar, Dr Hari Singh, Dr Ravindra and Dr Sabiha Kadari – Technical service team, Provimi Seva, Provimi Animal Nutrition India Pvt. Ltd.